Historically named Tangerine from Tangier, Morocco, the port from which the first tangerines were shipped to Europe. The Tangerine is an orange or red colored citrus fruit, a type of mandarin orange. They are smaller than most oranges and the skin peels off more easily. 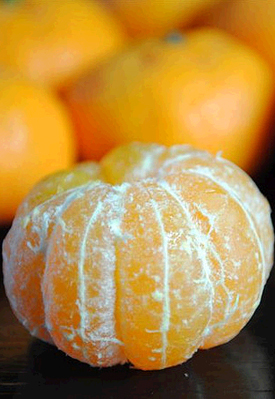 Tangerines are slightly hard, heavy for their size and pebbly-skinned. Our edible tangerine has shiny evergreen leaves and marvelously fragrant white flowers. Fruit and flowers appear over the course of a year, often at the same time. Very easy indoor care. Shipped in a round terracotta colored ceramic pot to accommodate the deep roots of a citrus tree. Regretfully, we are unable to ship this tree to AZ, CA, FL, HI, LA, PR & TX at this time due to current US Department of Agriculture restrictions.